The State Department was quick Tuesday to challenge comments by Syrian President Bashar al-Assad that he did not have control of his country's security forces amid the bloody crackdown on his political opponents. "I find it ludicrous that he is attempting to hide behind some kind of shell game, but also some sort of claim that he doesn't exercise authority in his own country," State Department spokesman Mark Toner said. "He has had opportunities in the past to end the violence," Toner said, listing initiatives presented by the Arab League, Turkey, other countries and the United Nations. "He has rejected all of them, usually through a long, convoluted process where he plays for time" Toner said at his afternoon briefing at the State Department. "There is just no indication he is doing anything other than cracking down in the most brutal fashion on a peaceful opposition movement." Toner was responding to a question about an ABC television interview Monday conducted by Barbara Walters with al-Assad. An ABC producer said that the al-Assad told Walters, "I am the president. I don't own the country so they are not my forces"; and "There is a difference between having a policy to crack down between having some mistakes committed by some officials. There is a big difference." Also Tuesday, the State Department announced that U.S. Ambassador Robert Ford is returning to Syria, and is scheduled to arrive late Tuesday. Amid fears for Ford's personal safety, he was brought back to Washington six weeks ago, "for consultations" in diplomatic-speak. His return coincides with Secretary of State Hillary Clinton's meeting with members of the Syrian opposition in Geneva, and is an additional signal of the Obama administration's outreach to critics of al-Assad. Toner said the Syrian government had been informed of Ford's return and the United States expects Syria to live up to its responsibility to protect the ambassador. "He's going to continue the same kind of work he did previously, which is delivering our message of support for the Syrian people and trying to provide reliable reporting on the situation on the ground, and engaging as best he can, given the limitations, the full spectrum of Syrian society on how to both end the bloodshed and begin a democratic transition," Toner said. Osama #2? Can we go in and kill him too please? I mean clearly he deserves it. Assad is a mad man and a modern Hitler of the 21 century. I do not know how Mr. Syrian President Bashar al-Assad thinks, after he kiling childern he make others sick by his words and help him by listen, very strange murder. Hitler was also a homosexual – as is this murderer. It seems to me if these leaders were truly"religious" Leaders they would want the world to know they were the "imam' who spread peace. This photo was taken in one of the religeous Eid, where all people meet in the mosque and prey to god to forgive them and help them to forgive others. You WISH you lived in the USA. Fortunately, we don't allow your kind here. it is in deed, and you should be careful of what the news throw at you. To nellkhoury you may be one of ASSAD thugs and you are blinded with hate. 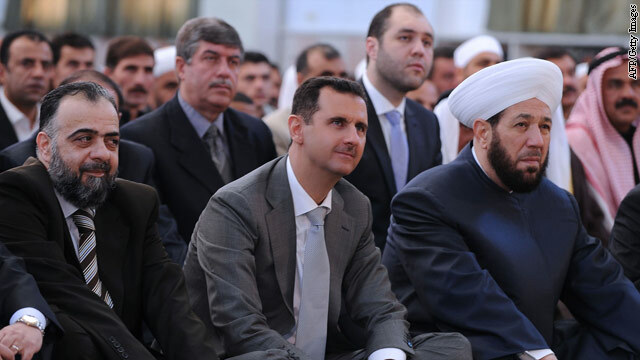 Assad has a bad plan for the christians in syria and lebanon. He will intimidate them and will creat various senarios for that. Christians in the Middle East has to be powerful and need to take a firm stand collectivelly. Christians in the region has suffered from Assad brutal grip and they have to join the freedom movement against all dictators . You have to know Mr. Khoury your name is arabic and christians have lived with muslim for thousands of year in good and bad time. Syria problem is a global one and will affect USA and its alies. what about the american goverments beating and aresting peacfull protesters and survailencing muslims for beeng muslims. and Us dear to juge the midel east? USA GET YOUR TROOPS HOME THEY GOT NOTING IN ABOUT 200 CONTRYS TO DO! The family of Assad has history of schizophrenia as a disease which has affected one of Bashar brother possibly Maher with known history of therapy. There is also suspecious and circulating rumors that the president himself has a known psychiatric issues prevented his father to choose him as a succesor and to his brother who was killed in a car accident. When Bashar Al Assad said he is not in charge he mean that...... You can clearly see how much he is dissociated from reality on the ground. He is not delusional now but he is responsible to be charged with crime against humanity since he is capable to make this interview with MRS Walter. This is a proven fact that he is accountable and liable infront of Hage for crime against humanity. Bashar may claim he is pscychotic in the future to protect him personally. The world has now a moral committment to help the region to get rid of him and those ugly people around him to save the whole world from escallation and war. And ladies and gentlemen, welcome to the world of Arab politics. Also, my opinions, we the US should not play any role in this. We have our own problems to worry about. Just BOMB THE back to the Stone Age ....... oh wait, they already ARE in the Stone Age.